It’s July. Yes, I know this is the UK and it’s a green and pleasant land and green stuff needs plenty of water…blah blah blah, BUT IT’S JULY. One should not expect to be bombarded by 30mph horizontal hailstones, rained on for hours and hours and left shivering by a relentless, howling northerly wind. IT’S JULY. I took part in the Polocini ‘Over’tops’ sportive at the weekend as I knew the route would be hard and would probably show me a few minor roads and steep climbs that I didn’t know existed, I also knew it would be well-organised, the food would be lovely (and free) and it was only costing me 20 quid. The 10 mile ride to the start in Oldham gave me fair warning (as if the doom-laden BBC weather forecast hadn’t done enough to put me off), as I rode away from the front door the heavens opened. The rain pelted down all the way to the start, where I signed in, ate some porridge and met up with Dave who’d done the sensible thing and drove. As we huddled around his car, waiting for the start, the rain got progressively heavier until it was bouncing a foot off the ground. My ‘sensible bike’ – the Ragley Cragg Vale with full ‘guards would be doing little to keep my backside dry today. Heading out of Oldham into the hills, the bad weather temporarily eased…that was, until it got really bad again and the rain started to bounce off the ground again. 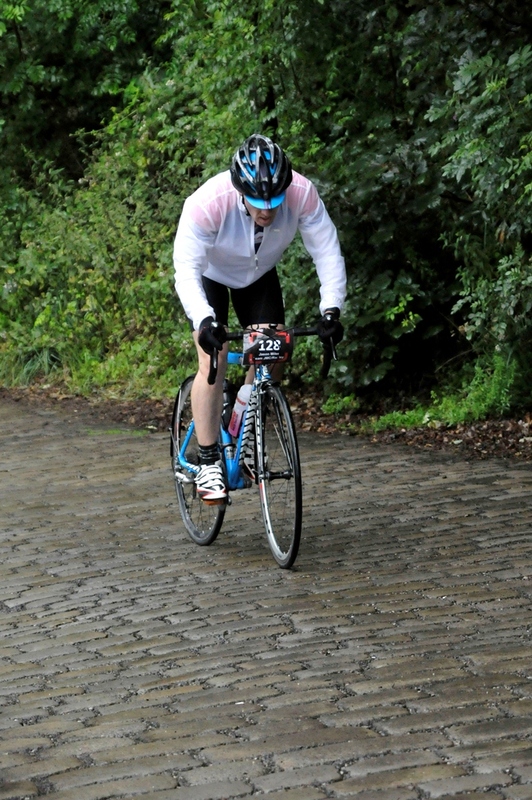 Over to the steep-sided valleys of Calderdale the climbing became tougher, including the silly-steep cobbles of the Shibden Wall, the rain continued to fall until the point at which we reached the summit of Cragg Vale…it was there that the heavens unleashed their full fury. Yeah, I might be wearing a white coat - but does YOUR hat match your bike? No. I thought not. A huge, gusting sidewind, that felt like it was headed straight for us from the surface of Jupiter, battered a surprise shower of hail into the side of our bodies – heads tilted at 90 degrees to the side to prevent our eyes being peppered by the bombardment of ice we tentatively made our way down the road towards Ripponden. More steep climbs later and back into Lancashire, progress was slowed somewhat by the gusting wind, now blowing in the opposite direction the way we were headed. The long and gradual climb across Castleshaw Moor was a slow grovel but eventually we made it back to civilisation, a bit shell-shocked at the worst July weather I can remember and back to the finish line for a bowl of hot soup (more free food!). Next weekend is the On-One Weekender – a road sportive on Saturday followed by an MTB marathon on Sunday. Can you guess what the weather forecast is? Lush! Proper weather. None of that fancy foreign rubbish. I’m starting to fear for my tan lines though.